Are you interested in advertising on my blog? Here is my media kit that has all the information you need that will help you make that big decision! All blogs, Youtube channels, and small businesses welcome! A 100x100px banner linked to your blog on my sidebar. You just have to put my banner on your sidebar in exchange! 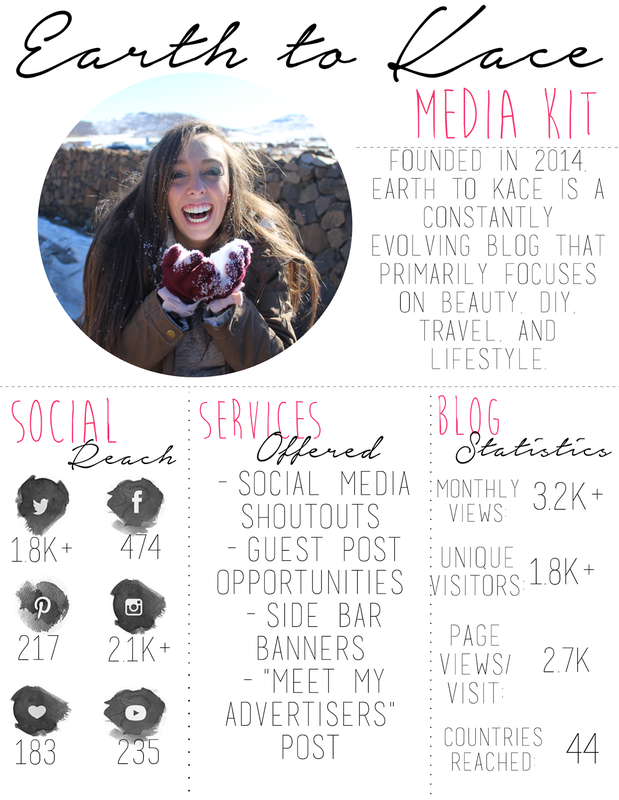 A 100x100px banner on my sidebar and regular social media promotions! A 300x150px banner on my sidebar, regular social media promotions, a featured interview/guest post opportunity (including a link of your choice), a shoutout in my monthly newsletter, and a "meet my advertisers" post featuring a paragraph written about you and your blog and ANY social media links you would like to include! If you are interested in any of these advertising packages or would like to know the availability for each package, please email me at earthtokaceblog@gmail.com with the subject "Advertising with Earth to Kace".